If your question is not addressed below, please contact us through our feedback form and we'll get back to you shortly. 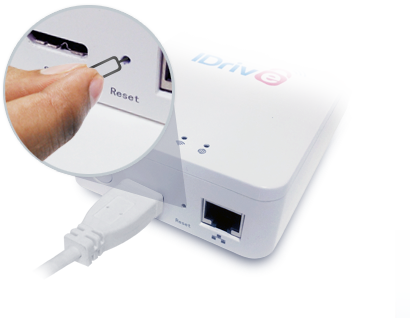 How to configure IDrive Wi-Fi in the Internet pass through mode? How do I connect to the IDrive Wi-Fi device wired from my computer? How to perform local backup and restore for my desktop data? 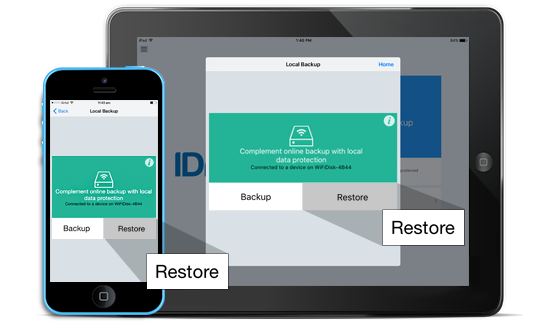 How to perform local backup and restore for my mobile device? Can I access Internet on my PC and other mobile devices while they are connected to the IDrive Wi-Fi device? What do the four LEDs in IDrive Wi-Fi indicate? 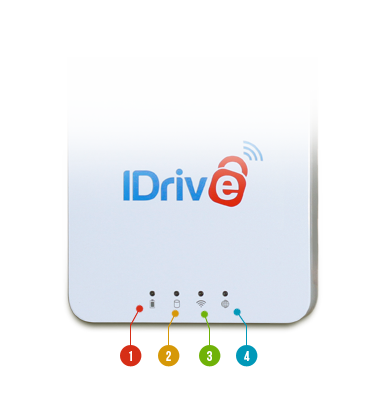 How do I set an access password for the IDrive Wi-Fi device? 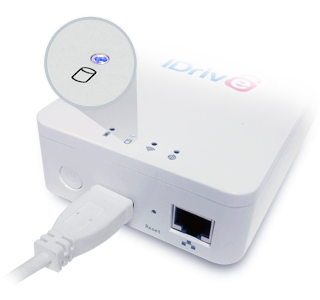 How to set up the IDrive Wi-Fi device as a NAS device on your PC and Mac? What if I need to backup a file larger than 4 GB? Can I update my IDrive Wi-Fi device Firmware? How do I reset my Wi-Fi device? Switch on the IDrive Wi-Fi device - plug in using the AC adapter, press and hold the power button for a few seconds, until the 'Wi-Fi' symbol lights up. Using LAN based internet connection. Connect IDrive Wi-Fi device to the network using LAN cable, or better yet, for best results, connect the IDrive Wi-Fi device to the back of the router for optimal pass through internet connection. 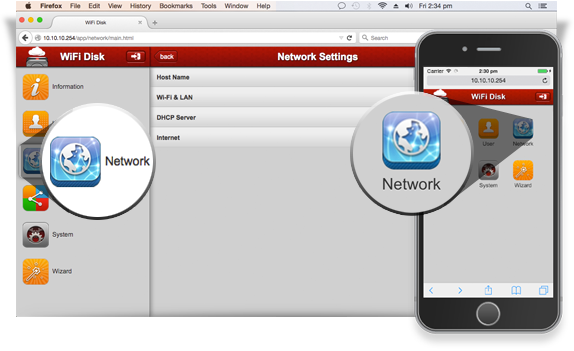 Power on the Wi-Fi Device, and from your desktop, tablet or mobile device, connect to the Wi-Fi network it broadcasts. (This will appear in your list of available networks as 'IDriveWiFi-XXXX'). 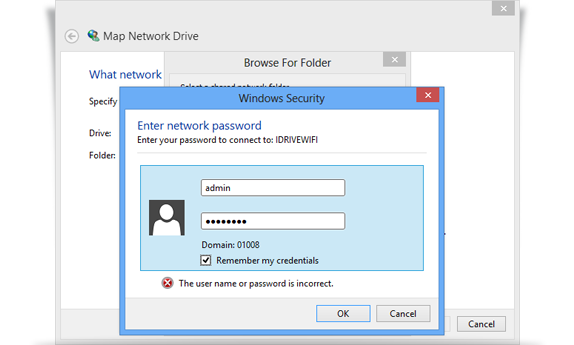 To connect to IDrive Wi-Fi first time, use default network password '11111111'. Open a web browser and go to http://10.10.10.254. Click/tap the Login button (no password required by default). Select Internet from the menu options. Select the SSID of the wireless network that provides Internet connectivity, from the available SSIDs. Enter your network password (if required). Use default network password '11111111' to connect to IDrive Wi-Fi. Security Note: We recommend you to change the default password for the IDrive Wi-Fi device - open a web browser, go to http://10.10.10.254 and follow the wizard. Connect the USB cable from your computer to the IDrive Wi-Fi device. Press and hold the power button for a few seconds, until the 'Wi-Fi' symbol light goes off and only the disk light remains lit up. You can consider the wired mode for the fastest possible speed of backup/restore, although the wireless mode is the most convenient one and also allows for multiple devices backup − concurrently up to 5 devices. Effortlessly backup multiple devices at once to the IDrive Wi-Fi device, via IDrive's desktop application for PC and Mac. Connect to IDrive Wi-Fi from the list of available Wi-Fi connections. With your username and password, login to the IDrive account. From the ‘Backup’ tab, select the ‘Backup files to my local / wifi device’ radio button. Select the file(s)/folder(s) to be backup. 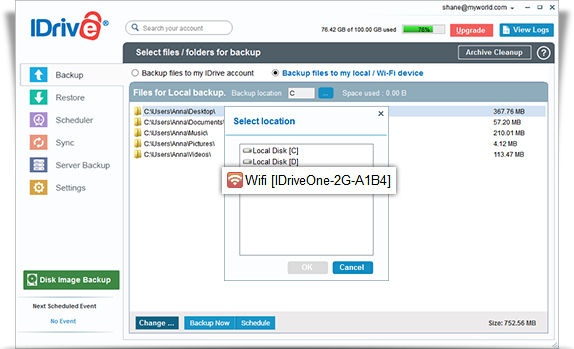 From the list of backup locations on your local drive, select IDrive Wi-Fi to backup your data to the drive..
Click 'Start Local Backup Immediately'. Select IDrive Wi-Fi, from the 'Select files / folders for restore' drop-down menu. 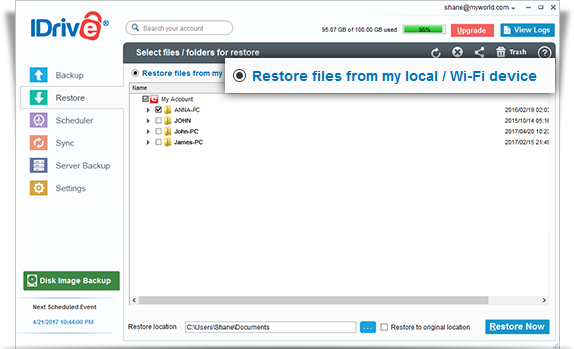 Click 'Restore Now', after selecting the file(s) / folder(s) to be restored. Conveniently backup all of your mobile devices to the IDrive Wi-Fi device, using the IDrive mobile app for iOS and Android. Switch on the IDrive Wi-Fi device. On your mobile, go to 'Settings' > 'Wi-Fi' > and select 'IDrive Wi-Fi' from the list that appears. Go to the IDrive app. 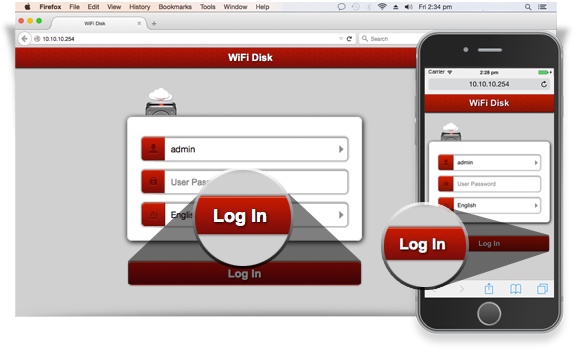 With your Username and Password, log in to the IDrive application. On the IDrive app home screen, tap > Local Backup. 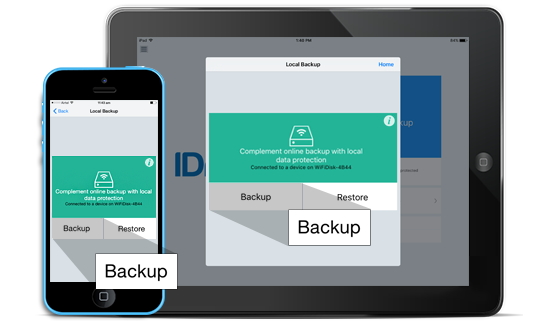 Select the device data your want to backup – Contacts, Photos, Videos, and Calendar. On your mobile, go to 'Settings' > 'Wi-Fi' and select 'IDrive Wi-Fi' from the list that appears. Tap ‘Restore’. The Restore screen appears with the list of devices backed up to it. Select the backed up file that you want to restore and tap corresponding to it. 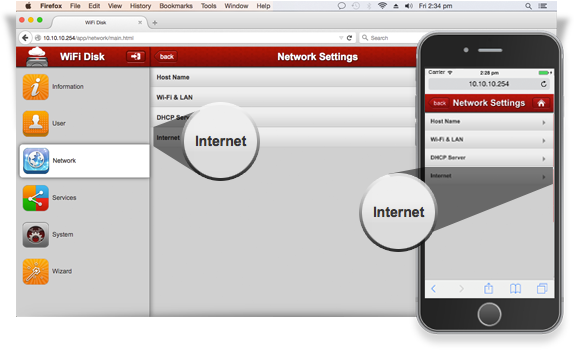 configuring your Wi-Fi device using Internet pass-through mode. 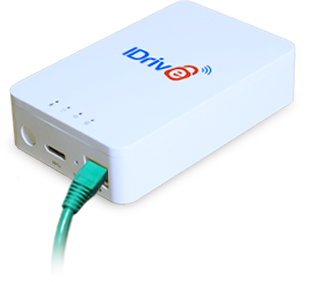 The four LEDs in the IDrive Wi-Fi device indicate the battery status, Read/Write activities of the hard disk, Wi-Fi connectivity, and Internet connectivity. Red iconPower LED: Indicates the battery life of the Wi-Fi device by the colors, Green and Red. Yellow iconHDD LED : Indicates the Read/Write status of the HDD by the colors, Blue and White. Green iconWi-Fi LED : Indicates the Wi-Fi connectivity of the IDrive Wi-Fi device by the color, Blue. Green iconInternet LED : Indicates the signal strength of the IDrive Wi-Fi device when connected in different modes. Note: If you only want to access HDD (wired connection to computer), press the device until Wi-Fi and internet LED turns off. To access disk, Wi-Fi and internet, press the device till all LEDs are lit up. 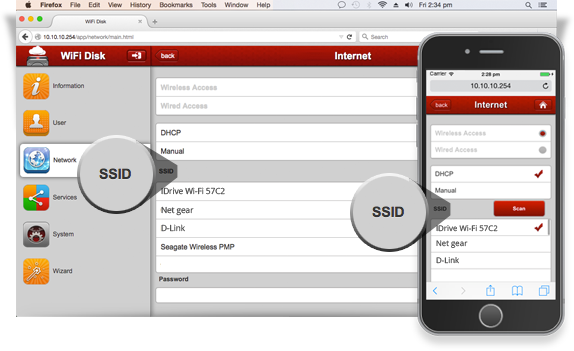 Connect your computer or mobile device to IDrive Wi-Fi. 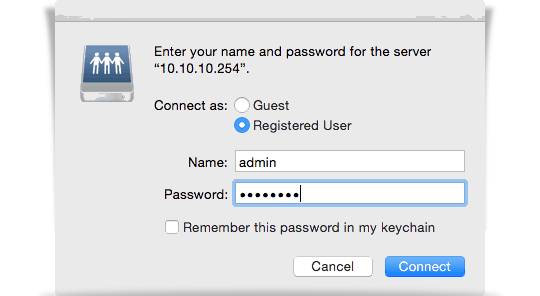 Note: By default, the device Wi-Fi network password is ‘11111111’. 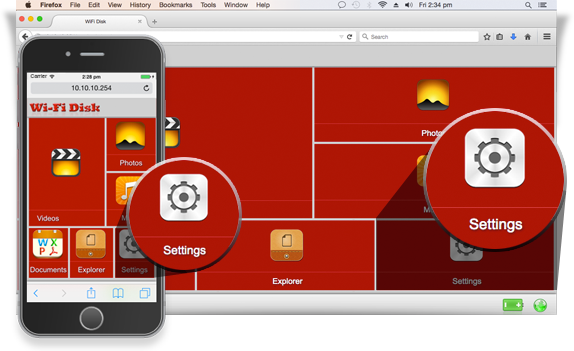 Using any web browser, go to http://10.10.10.254. In the Username field, enter 'admin' and click/tap 'Login'. Go to 'Settings' > 'User' > 'Admin'. Enter 'Password' and 'Confirm Password'. You have successfully set the access password for your IDrive Wi-Fi device. Click Computer > Tools > Map network drive. 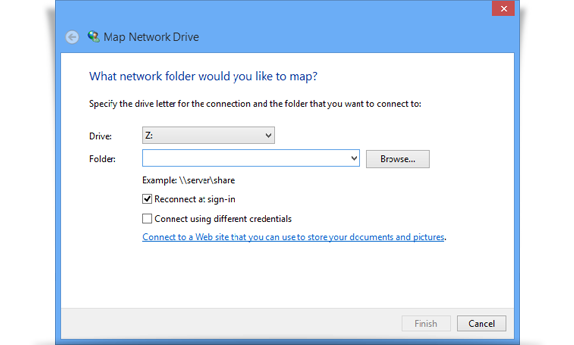 The Map Network Drive dialog box appears. On the Drive field, choose a drive letter. Click Browse... .The Browse For Folder dialog box appears. Select IDRIVEWIFI and click OK. In the Windows Security dialog box, enter admin as the Username and click OK. Note: The default password is blank. To change the default password for the IDrive Wi-Fi device - open a web browser, go to http://10.10.10.254 and follow the wizard. 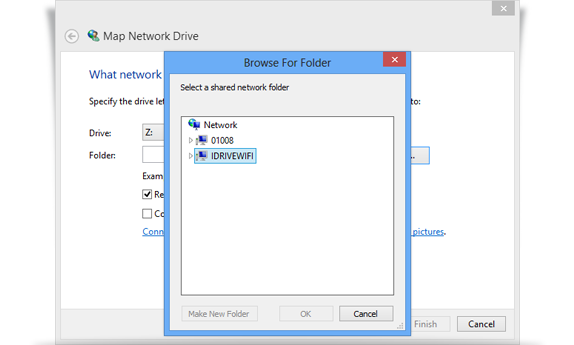 On the Browse For Folder window, open the IDRIVEWIFI directory tree and select a share folder. The default folder is WiFiDisk1-Volume1. Click OK and confirm the selected drive and the folder path. From the Finder, select Go > Connect to Server... or press command K. The Connect to Server dialog box opens. In the Server Address field, enter smb://10.10.10.254 and click Connect. Select the Registered User option and enter admin as the Username and click Connect. To reset the drive, first press and hold the power button to turn on the drive (the lights will come on). Then, using a paperclip or other thin, straight object, insert it into the opening labeled 'Reset' and press and hold until the lights flash. Your Wi-Fi device will be reset to the default settings.